I rushed home from work for dinner tonight and had to make it out again in time for our Cracker Jack Stampers meeting tonight. It’s Rachel’s day off so she cooked. As most of you know, we love to experiment with new recipes in our house and Rachel tried one tonight from Rachael Ray. It was really good! A lot of prep but once we all helped with the prep the cooking time was pretty quick, which was good because I did demo tonight at club and had to get there early to get set up. I was showing the group the milk resist stamping technique from Lisa Bebi I’ve been playing with recently. It’s a technique I tagged years ago in an old Somerset Studio magazine with every intention of trying it when I had time. Well, fast forward several years later and I’m thumbing through the old magazines for inspiration and I find the article again. I thought it would be perfect for the Cracker Jack Stampers because we like to learn techniques we haven’t tried. I packed up my sweetened condensed milk, skim milk, stamps, tags, inks and water bottles and headed out. The demo was a success. Everyone was really pleased with the outcome and I’m sure most of the gang will be trying this one at home. If you’d like to give it a try here’s the basics: mix sweetened condensed milk with skim milk (50/50) in a flat bottom container. 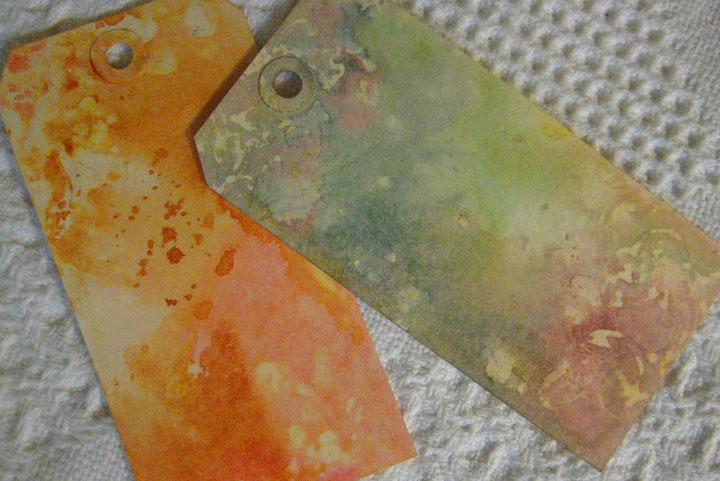 Dip your stamp and stamp onto a tag or heavy-weight paper. Heat set (it smells so good! ); this is your resist. Add several ink colors – I like using a wrinkle-free distress technique with Ranger’s Distress Inks. Gently wipe inks from resist stamped area. It leaves a very soft look and makes a wonderful background for tags or card matting. You can find Rachel’s Hungarian Portabella Paprikash recipe under Healthy Eating here on foodnetwork.com. But trust me – prep time takes more than 20 minutes. Enjoy the meal and the stamping! Cracker Jack Stamper’s meet at 6 p.m. the second Thursday of each month at Michael’s in Brighton. I’ll add you to our email list! Hope to see you next time. Thanks Lori! Great seeing you last night. Both of these recipes sound yummy! I am going to try them both! 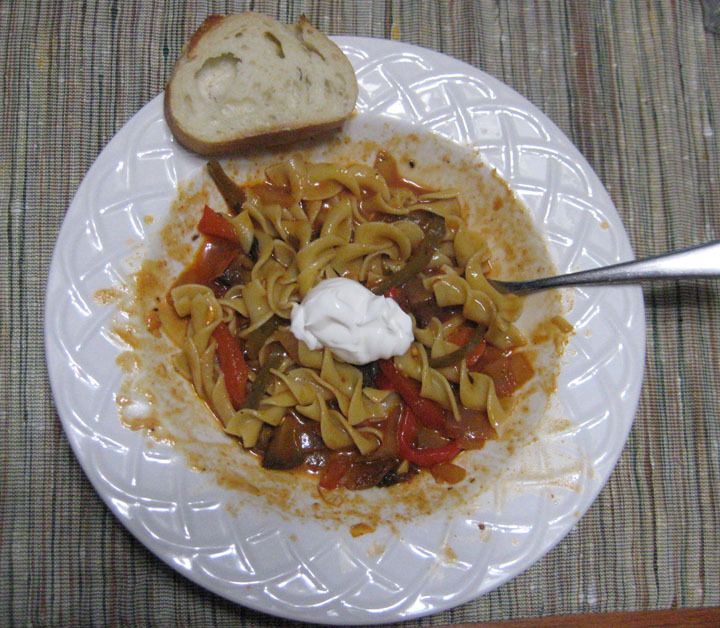 The dinner was great and the milk-resist technique is so very different – you’ll love them both! Let me know how they turn out for you. Hi Linda – I want to try that! Sounds like a very interesting way to scrapbook! Wondering if you could help me out here: While on vacation last week I accidentally deleted the last post from Scrap Tales when they were closing. If you happen to have that post, could you please forward it to me? I would be very very happy and grateful if I could get that back!! Thanks, Cathy C.
Sorry, but the store closed and all that is gone and done with. Have fun with the technique and let me know how it works out for you.